Ships moving through a busy channel off Washington state's San Juan Island are slowing down this summer as part of a study to determine whether that can reduce noise and benefit a small, endangered population of killer whales. The Puget Sound orcas spend summer months in a major shipping channel in the Salish Sea that is critical habitat for the whales. The trial, led by the Vancouver Fraser Port Authority, is trying to understand whether reducing commercial vessel speeds can reduce underwater noise. Orcas use clicks, calls and other sounds to navigate, communicate and forage mainly for salmon. Noise and other impacts from vessels is one of three major threats facing the whales. Lack of prey and pollution are the others. They currently number 78. The two-month trial asks cruise ships, ferries, bulk containers and other commercial vessels to voluntarily slow to 11 knots through Haro Strait. Average vessel speeds typically range from 13 knots for bulk carriers to 18 knots for container ships. The project began in early August and ends Oct. 6. Nearly five dozen industry participants, including Washington State Ferries and Holland America Line, have formally agreed to slow down when it's feasible and safe, port officials said. 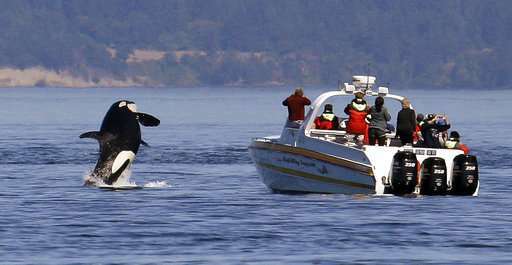 Recreational and whale-watching boats are encouraged to slow down as well. In the first week, about 59 percent of commercial vessels reduced their speed. Participation increased to about 68 percent in the second week. It dropped to about 55 percent in the third week with stronger tidal currents contributing to concerns about costs and not meeting schedules. On average, 95 commercial vessels transit Haro Strait each week. "We're certainly very encouraged for that level of participation," said Orla Robinson, program manager for the Enhancing Cetacean Habitat and Conservation program led by the Vancouver Fraser Port Authority. The program launched in 2014 to bring shipping industry and other groups together to reduce impacts of shipping-related activities to orcas in the southern coast of British Columbia. The port is offering $500 each trip when ships slow down. Earlier this year, it began offering discounted harbor rates for quieter ships and vessels that install technology to reduce propeller and other noise. "Noise can interfere with these really important functions such as eating, navigating and communicating to stay together as a family group," said Marla Holt, a research wildlife biologist who studies marine mammal acoustics with the Northwest Fisheries Science Center in Seattle. There's evidence that slowing down can be an effective way to reduce underwater noise from vessels, she said. Reducing vessel speed by one knot can reduce noise level by one decibel. Studies have shown the whales spend more time traveling and less time foraging in the presence of boat traffic. Their calls are also louder when noise levels are higher. "Just by listening to the ocean, it becomes quite clear that ships are dominating the landscape," said Scott Veirs, a marine biologist with Beam Reach, who will independently study how orcas respond to the slower ship speeds during the trial. His research is privately funded and independent of the port project. 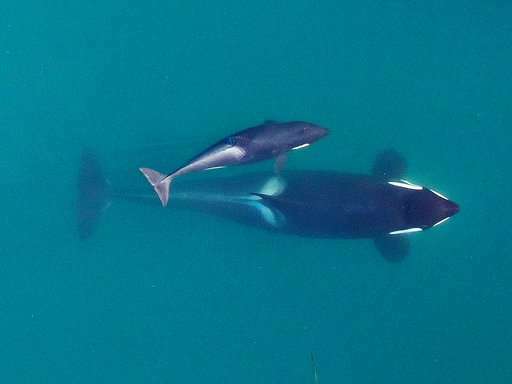 Veirs said his study will use a network of hydrophones—microphones that detect underwater sound waves—to analyze whether orcas change the sounds associated with their foraging. When orcas hunt for Chinook salmon, they send out a click and listen for the echo of the click off the fish, he said. "If the noise is making that hunting process more difficult, they might click louder, or might click more often or stop altogether," he said. Researchers with Seattle-based Oceans Initiative will lead another study looking at changes in the orcas' surface behavior in response to the noise, Veirs said. The trial also comes as National Oceanic and Atmospheric Administration Fisheries is considering a whale protection zone off the west coast of San Juan Island. Most motorized vessels would be banned if a no-go zone is approved. Several groups who petitioned for the zone argue it's a common-sense approach to reduce boat noise and disturbance that can be put in place immediately. Others worry the efforts will require too much time and money and divert attention from the fact that orcas don't have enough of their preferred Chinook salmon to eat. Some have suggested NOAA Fisheries implement a speed zone in Haro Strait as an alternative.